The Lagos State government has called on motorists in the state to comply with the provisions of the State Traffic Laws to avoid consequences. The Attorney General and Commissioner for Justice in Lagos, Mr. Adeniji Kazeem, who made the call in a statement on Tuesday warned that the government would not hesitate to bring the full weight of the law on offenders. He said motorists must be reminded that violators of the law risk between one and three years imprisonment and forfeiture of their vehicles to the state government. “Lagos State Government remains committed to enforcement of Law and Order to make living in the State an enjoyable and stress-free experience,” he said in a statement from the State Ministry of Justice. The commissioner said the Ministry of Justice, through the Mobile Courts, would intensify effort to prosecute the lawlessness of unruly motorists to restore sanity on Lagos roads. This development, according to him, is in line with governor Akinwunmi Ambode’s directive on efforts of the government to curb the lawlessness of some motorists, which in recent times, had led to gridlock and caused untold hardship for commuters in the state. Kazeem specifically said the ministry would ensure full implementation and compliance with the Road Traffic Law and other extant laws on road management applicable in the state. According to the attorney general, Schedule I of the said law lists various traffic violations such as disobeying traffic control personnel and assault on their person, parking on a yellow line, use of Bus Rapid Transit (BRT) route by unauthorized vehicle, among others as offences that would be strictly prosecuted. He, therefore, advised members of the public to be law abiding and cooperate with traffic officials in ensuring compliance and sanity on the roads. APC Attack Aisha Buhari Over Her Comment? Hey Buddy!, I found this information for you: "Break Traffic Laws In Lagos and Get 3 Years Imprisonment – Lagos Govt. Warns". 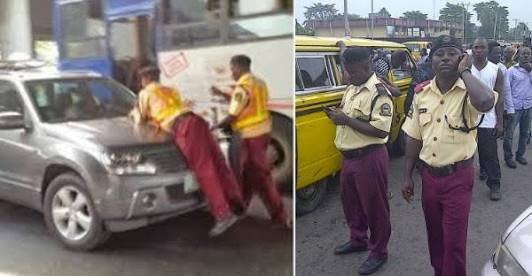 Here is the website link: https://headlinenews365.com/break-traffic-laws-in-lagos-and-get-3-years-imprisonment-lagos-govt-warns/. Thank you.